Reliability and accuracy are paramount when labeling blood bags. 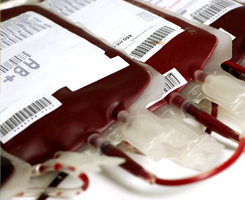 Due to the flexibility of the bag, blood bag labels must maintain a strong adhesion yet conform to the shape of the bag. Because blood bag labels are direct thermal, the print quality is superior when identifying expiration dates, blood types, and other vital information. The blood bag labels offered by Ohio Identification Solutions feature FDA-approved adhesives, compliant with 21 CFR 175.105 and are designed to comply with ISBT-128 blood bag labeling standards and FDA regulatory requirements . Our supplier has taken the time to test the most current technology in blood bag label materials and has developed a blood bag label with performance that is superior to others in the healthcare industry. Click here to contact us for more inforamtion about Blood Bag Labels.